As Summer is upon us, pet owners everywhere, flea treatments at the hip, are preparing to go to battle. The villainous foe? Of course: the ever-imposing threat of a bad flea infestation. Even though fleas can thrive during all four seasons, our pets typically spend more time outdoors in nice weather, increasing the chance that they come in contact with fleas. If you’ve got a furry, four-legged member of your family then you are probably very familiar with monthly flea treatment. 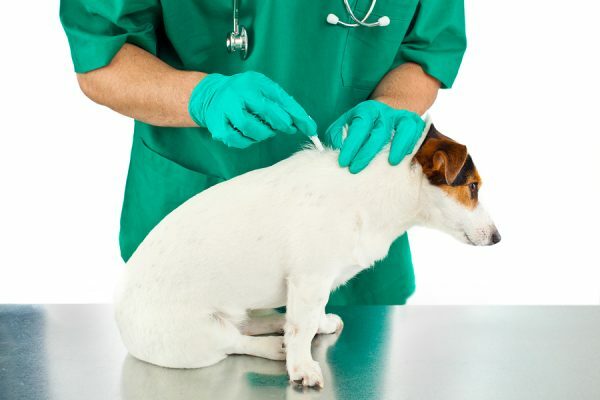 You snip off the plastic tip and squirt the liquid miracle between the shoulder blades of Fluffy, or Fido, thus keeping them safe from the discomfort and dangers associated with fleas. But, how does this magical liquid work? And, when should you use flea treatments? How do you know if your pet even needs this medicine? Flea eggs on your pet’s skin and fur (These look like small white specks). Flea dirt, or excrement, on your animal’s skin and fur (dark specks) These will fall from your pet as you brush him. Try having him stand on a white towel while you comb through his fur. Red bumps or pimple-like spots. (Check on their belly or at the base of their tail). If you’ve determined that your pet does indeed have fleas, it’s time to spring into action to get rid of the little buggers for good. You have several options for flea treatments, but the most popular are topical applications or oral medicines. You will want to choose an option that kills both adult fleas on your pet, any immature larvae that may already be existing, and also prevent any eggs from hatching. These flea treatments are ingested by your animal and work only when an adult flea bites your pet. The chemicals in these products then impact the parasite causing its death and/or impacting its ability to reproduce. These treatments do not typically kill larvae or eggs though so you will need to be aware of how these are used and how effective they will be. Although these kinds of flea treatments are typically much more effective at killing adult fleas than topical methods, you may still need to treat your home to totally eliminate the problem. Pet owners usually like this method of flea prevention because it isn’t as messy as many topical treatments and is very easy to administer. Not only that, some of these pills can start working in as soon as 30 minutes. This will start to offer protection and relief to your pet sooner than many other methods. Because they are quick and effective, by traveling through your pet’s bloodstream, they are often one of the fastest ways to stop your pet from suffering. Powders and shampoos can help to kill adult fleas. You can (and should) purchase a special flea comb to help remove fleas and eggs from your pet. These are particularly helpful with puppies and kittens who may not be old enough for some of the stronger methods of flea removal. These shampoos and dips are also designed to help soothe itchy and red skin. However, you will still want topical drops to kill eggs and larvae. Topical drops are applied to your pet’s shoulder blades (where they cannot reach to lick the chemicals) and then spread across their body using the animal’s natural body oils. This process takes about a day to spread to all areas of the pet and distribute the medicine. Once the medicine is applied it begins to release toxins over the course of a month that make it so that fleas can no longer live on the animal. These types of flea treatments may also contain chemicals called Insect Growth Regulators (IGRs) which will help keep larvae from maturing. Remember, even though it is the adult fleas that do the biting and cause discomfort to your pet, most of the flea population exists in egg form and hides in furniture, carpeting, and pet fur. Do not forget that if your pet has fleas it is likely your home also has fleas. You will want to get rid of any lingering fleas or eggs that are hiding out in your home. You will need to use flea treatments on your pets bed, carpets, mats and any furniture that your pet comes in contact with. There are specialty house bombs and carpet cleaners designed to help you with this problem. Be sure to wash all bedding and linens in hot water to rid your home of any possible infestation. No matter what method of parasite control you decide to use, or which products you purchase, it is important for you to also get advice from your veterinarian. This is especially important if it is a product that you have not used before. Be sure to read the label carefully and follow the directions. Be certain to note any changes in your pet’s behavior after the medicine has been given and contact your veterinarian immediately if you have any concerns. Please feel free to contact our knowledgeable, friendly staff if you have any questions regarding the best flea treatments for your pet, or if you think your pet has fleas. We look forward to helping you keep your furry pal happy and healthy. Still have questions about flea and tick prevention and control? Contact us today.